"Blame it on the Eclectic-a, Jazz-a, Funk-a, Samba Nova." "Robin's universal appeal rises from her ability to play anything-- Jazz, Classical, Latin, Pop and Funk. A strong solo as well as ensemble performer, Chicago native .....Robin's versatility are her Cocktail Set Tributes-- single set musical biographies .... Complete with narration and compelling musical execution, Robin has dazzled audiences on international waters at SRO (standing room only) performances. I have heard this entire cd several times now and I love it more each time. Ms Lukas level of creativity here stands out among the greats. Her subject matter is imaginative and vivid, while keeping her own special brand of humor just under the surface. It is her excellent lyrical style as well as her musical vision that produce arrangements so deep that it takes several listens to get all the nuances of rhythm and harmonic textures. I've followed her career for quite some time now and this cd takes her to a new level. 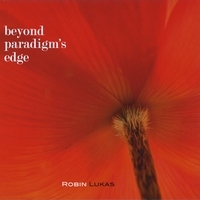 If you like a smooth jazzy true original you'll love Beyond Paradigm's Edge. Great music, lyrics and vocals. A pleasure to listen to. Robin is such an inspiration, cache of talent, pillar of strength and grounded individual, her music exudes everything she's about which is why I listen to it and what I get out of it.